Join Honorary Chairs Penny and David Yao and Emcee Bob Levey, former Washington Post columnist, at the 5th Annual Library After Dark Gala, FOLMC recognizes the library staff, volunteers, donors, and community leaders who make Montgomery County Public Libraries (MCPL) an outstanding, nationally-recognized system. 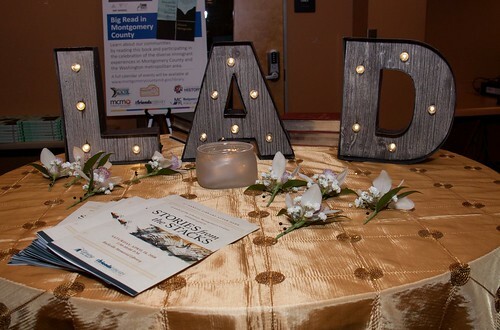 This year’s theme Libraries Take You Places celebrates not only the exotic settings where books transport readers but also the ability of MCPL to transform lives by providing rich resources to learn, grow, and create community. This is a chance to pay tribute and give back to libraries through your donations and your attendance at the premier library event of the year. Address: 21 Maryland Avenue, First Floor. Parking: Available across the street in Garage A. Please take a ticket, validated parking will be available at the Gala. Directions can be found here. Time: Doors will open at 7:30pm. Awards Ceremony will begin at 8:30pm. Silent Auction ends at 9:30pm. Food & Beverage: Enjoy a variety of delicious appetizers, desserts, wine, coffee and tea. Photos by Dona Jones Photography.